1) The paper has been published in GPS Solutions - The Journal of Global Navigation Satellite Systems (ISSN: 1080-5370 (Print) 1521-1886 (Online)). The paper covers the work of FIG Working Group 5.4 – GNSS; GNSS Precise Point Positioning (PPP) and gives and overview of misconceptions, challenges and opportunities. Within the last decade, GNSS Precise Point Positioning (PPP) has generated unprecedented interest amongst the GNSS community and is being used for a number of scientific and commercial applications today. Similar to the conventional relative positioning technique, PPP could provide positioning solutions at centimeter-level precision by making use of the precise carrier phase measurements and high accuracy satellite orbits and clock corrections provided by, for example, the International GNSS Service (IGS). The PPP technique is attractive as it is computationally efficient; it eliminates the need for simultaneous observations at both the reference and rover receivers; it also eliminates the needs for the rover receiver to operate within the vicinity of the reference receiver; and it provides homogenous positioning quality within a consistent global frame anywhere in the world with a single GNSS receiver. Although PPP has definite advantages for many applications, its merits and widespread adoption are significantly limited by the long convergence time, which restricts the use of the PPP technique for many real-time GNSS applications. We provide an overview of the current performance of PPP as well as attempt to address some of the common misconceptions of this positioning technique – considered by many as the future of satellite positioning and navigation. Given the upcoming modernization and deployment of GNSS satellites over the next few years, it would be appropriate to address the potential impacts of these signals and constellations on the future prospect of PPP. In recent years the Global Navigation Satellite Systems (GNSS) Precise Point Positioning (PPP) technique has increasingly gained interest and widespread adoption within the GNSS community. A number of governmental, academic and commercial PPP services have been established to support scientific and commercial Position, Navigation and Timing (PNT) applications. In March 2012, the first international symposium on PPP organized by the German Federal Agency for Cartography and Geodesy (BKG) was held in Frankfurt am Main, Germany. The symposium brought together experts from universities, governments and the private sector to discuss technical issues relating to PPP. It was a great success, with 180 participants from more than 30 countries. In the following year in June 2013, the International Association of Geodesy (IAG) in partnership with NRCan, the International GNSS Service (IGS) and York University hosted a second international PPP workshop in Ottawa, Canada. Such workshop activity is indicative of the prominence given to PPP as a powerful PNT technique for next generation satellite navigation. For three decades, relative (or differential) positioning has been the dominant precise positioning and data processing technique. In relative positioning, the coordinates of a point are determined relative to another reference point with known coordinates. This eliminates or reduces most GNSS observation errors that are spatially correlated at both the unknown and reference points, thus providing high accuracy positioning solutions. Originally, the implementation of this relative positioning technique for many commercial applications involved one reference station and one or more rover receivers operating in a local area, in real-time. Centimeter- to submeter-level positioning accuracy can be obtained, with the accuracy mainly dependent on whether the pseudorange or/and carrier phase observations are used, and in the case of the latter, whether ambiguity resolution was successful. Carrier phase processing provides the most accurate positioning results, in real-time and in dynamic mode, in a technique known as “Real-Time Kinematic” (RTK). RTK is now, and has been for many years, the industry standard procedure for precise positioning and navigation applications such as machine control, precision farming, surveying, and mapping (Rizos et al. 2012). But this technique was soon augmented to a regional network of reference stations that permitted the extension of the service coverage area in the so-called “network-RTK” mode. PPP emerged as an alternate GNSS positioning technique in the late 1990s (Zumberge et al. 1997). PPP in the standard mode utilizes dual-frequency pseudorange and carrier phase observations from single GNSS rover receivers, and requires precise satellite orbits, clock corrections (and other error modeling) to generate high accuracy positioning solutions. The PPP and relative positioning approaches were originally established independently of each other, to address different purposes. PPP was first developed to enable efficient processing of large global networks of GNSS data. It quickly emerged that it is also a viable alternative to the traditional relative positioning technique because it does not have the limitations of the latter, such as the need for a nearby reference station and the associated baseline length constrain. One major drawback of PPP, however, is the long solution “convergence time”. It can range from tens of minutes to several hours (Bisnath and Gao 2009; Hèroux et al. 2004; Kouba 2009). The motivation for this paper is to extend the work of Bisnath and Gao (2009) and Rizos et al. (2012) who described the performance of PPP technique and speculated on its future potential. The goal is to provide an insight into the current prospects of PPP and to address some of the common misconceptions concerning this positioning technique such as the current performance of PPP; PPP Ambiguity Resolution (PPP-AR) and validation; the use of ancillary data such as atmospheric information derived from regional reference stations networks to aid integer ambiguity resolution and re-convergence; the importance of PPP “infrastructure” that allow precise orbits and satellite clocks to be determined; as well as the data dissemination mechanisms which are mandatory for real-time PPP. Given the upcoming modernization of GPS signals and the deployment of other GNSS and Regional Navigation Satellite Systems (RNSS) satellites, it is necessary to speculate on the potential benefits and challenges of these additional signals and constellations in the context of multi-GNSS PPP. This section addresses some of the common misconceptions in PPP, e.g., how good a PPP solution is and if phase ambiguity resolution in PPP could speed up the long convergence time. It will also elucidate possible technical limitations and prospects of using PPP technique in real-time PNT applications. How Good is a Standard-PPP Solution? The metrics used to assess the quality of the PPP estimates are: accuracy, precision and convergence time. In PPP there is minimal difference between accuracy and precision as the residual biases are typically at centimeter level owing to the rigorous error modeling in PPP. The convergence time is defined as the time required for the position or ambiguity estimates to reach a specific level of accuracy, and do not deviate beyond this level after reaching it. In practice, each user often uniquely defines the level of accuracy for convergence. Numerous researches have shown millimeter- to centimeter-level point positioning accuracy can be achieved for static dual-frequency PPP processing using a 24-hour good quality dataset (Colombo et al. 2004; Gao and Shen 2002; Hèroux and Kouba 2001; Kouba 2009; Witchayangkoon 2000; Zumberge et al. 2001). Seepersad and Bisnath (2014) investigated the performance of the standard-PPP technique in static and kinematic mode using one week datasets collected from 300 IGS stations from 1-7 July 2012. 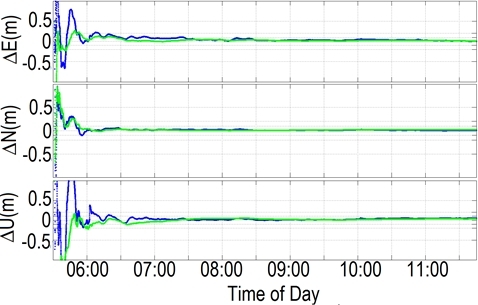 Dual-frequency ionosphere-free combination of GPS measurements was used together with the IGS 5-minute final orbits and 30-second clock correction information. The tropospheric delay was estimated as part of the adjustment process and no integer PPP ambiguity resolution was attempted in their investigation. The IGS accumulated weekly SINEX station coordinates were used as reference. They concluded that PPP in static mode could provide positional accuracy of 7 and 13 mm in the horizontal and vertical components, respectively using such a 24-hour dataset. In kinematic mode, the conservative accuracy of the horizontal positioning component was 46 mm, and 72 mm in the vertical component. It is expected that the estimated vertical component will be less accurate than the horizontal component due to the satellite geometry as well as the quality of the correction models used, e.g., tropospheric modeling for estimating the tropospheric delay. It was also shown in Seepersad and Bisnath (2014) that the quality of estimated PPP solutions is linked to the geographical location of the stations. Some stations portrayed less accurate position estimates and longer convergence time, which may be attributed to the weak estimation of the wet component of the tropospheric delay, as well as modeling of other PPP related errors such as solid Earth tides and ocean loading. The PPP solutions in static mode were slow to converge, with approximately 20 minutes required for 95% of solutions to reach a horizontal accuracy of 20 cm or better; and the convergence time was much longer for kinematic processing (Seepersad and Bisnath 2014). As a general rule, a minimum of one hour is required for the horizontal solution from a standard-PPP static processing to converge to 5 cm. Table 1 lists the recommended convergence time for static PPP to achieve the required horizontal accuracy. It should also be noted that the quality of the position estimates is very dependent on the observation session length, the geographical location of the receiver, the number and geometry of the visible satellites, user environment (i.e. the degree of multipath disturbance), and the quality of the observations. Table 1 Recommended convergence time for static PPP solution to converge (Seepersad and Bisnath 2013). 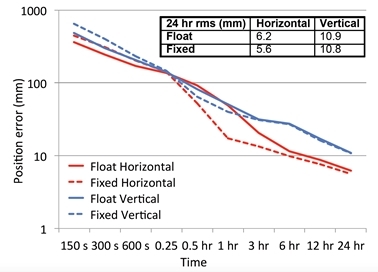 Standard-PPP with “float ambiguities” is an adequate technique for long period static applications, but certainly not for short observation sessions and/or kinematic operations. In standard-PPP the carrier phase ambiguity is a combination of the integer ambiguity term and hardware dependent biases originating from the satellites and receivers, thus resulting in the phase ambiguity term being a real-valued quantity. This is true for any single receiver positioning using carrier phase measurements, which explains why PPP requires an extended convergence period to reliably estimate these “float ambiguities”. In contrast, in relative positioning the double-differenced ambiguity term, between two receivers and two satellites, has an integer nature (hardware dependent biases have cancelled) and consequently can be “fixed” to the correct integer value, thus enabling instantaneous positioning in real-time. Since 2007, a number of researchers have been making progress on the challenge of resolving carrier phase ambiguities in PPP processing. In general, there are two methods: the “Uncalibrated Hardware Delays” method (Bertiger et al. 2010; Ge et al. 2007); and the “Integer-Recovery-Clocks” (Laurichesse et al. 2009) or “Decoupled Clock Model” (Collins 2008) method. An in-depth discussion can be found in Geng et al. (2010) and Shi (2012). It has been shown that the ambiguity-fixed position estimates from these methods are theoretically equivalent (Geng 2010; Shi 2012). The term “fixed-PPP approach” is used here to describe PPP processing with phase ambiguities resolved. The benefit of correct integer ambiguity fixing is that it can shorten the convergence time thus potentially improving the accuracy and consistency of PPP solutions. Implementation of the fixed-PPP approach requires that modeling and processing be standardized at both the service provider and user-end (Teunissen and Khodabandeh 2015). The above-mentioned PPP-AR methods vary in terms of the strategies used to separate the hardware delays from integer ambiguities. Therefore, fixed-PPP is only possible provided the service providers also deliver to users estimates of the hardware biases, in addition to the satellite orbits and clocks, which are consistent and suited for PPP ambiguity fixing. Figure 1 shows the average rate of convergence of float-PPP and fixed-PPP positioning as a function of horizontal and vertical position errors. Similar to the processing strategy adopted by Seepersad and Bisnath (2014), the dataset used was one week of data from 1-7 July 2012 from approximately 300 globally distributed IGS sites. Only GPS data were processed in static mode and the IGS accumulated weekly SINEX station coordinates were used as reference. In this instance, both float- and fixed-PPP solutions were computed. It can be seen that ambiguity fixing provides an improvement in the horizontal component estimates, and to a lesser extent the vertical component. There is generally little difference between the float and fixed solutions during the first 15 minutes of the solutions and after 6 hours. In fact, it is interesting to note that during the first 15 minutes the float solution is slightly better than the fixed solution, i.e. a specific time period is still required for the float solution to converge to ensure correct integer fixing. Fig. 1 Average position error of float-PPP and fixed-PPP solutions. The carrier phase ambiguity is a unique random constant for each continuously tracked station-satellite arc. The only direct source of information on its value is from each corresponding pseudorange observation. This means that the ability to derive as estimate of the ambiguity is strongly influenced by the quality of the pseudorange observations, and to a lesser extent the carrier phase observations. In PPP, the convergence period occurs as the solution transitions from a pseudorange-only solution to a float-ambiguity carrier phase solution. The pseudorange observations are filtered by the smoothly varying carrier phase observations, which leads to a convergence period after the initialization of the solution. This highlights the fundamental paradox of PPP-AR in that a substantial convergence period is still required. Furthermore, the PPP-AR technique may not necessarily be able to consistently resolve the ambiguities correctly, or to maintain fixed solutions throughout the processing given the inherently weaker model of PPP (Bisnath and Collins 2012). This could significantly degrade the quality of the estimated position solution. Some standard ambiguity search and validation methods, e.g. the ratio test and their empirical thresholds, do not work well for PPP-AR, especially when the satellite geometry is poor (Collins et al. 2009; Shi 2012). Therefore, rigorous integer ambiguity validation methods specifically applicable for PPP remain an issue to be investigated. Is PPP Ambiguity Resolution a Solution to All Problems? Isolating the phase ambiguities as integer values in PPP does not by itself permit rapid ambiguity resolution (Collins and Bisnath 2011). The convergence period of standard float-PPP processing remains, which constrains the adoption of the PPP technique for real-time GNSS positioning and navigation applications. What is even more problematic is that this convergence process has to be repeatedly applied whenever satellite tracking loss occurs, which further devalues the practicability of real-time PPP. So the problem of convergence for fixed-PPP is not only an issue after a receiver’s cold start but also after any interruption of the measurement due to signal obstruction. The key to instantaneous AR for short baseline RTK lies in the a-priori knowledge of the ionosphere. In short baseline RTK, the ionospheric delay is almost completely corrected for using the nearby reference station observations. This significantly enhances the underlying model strength making rapid ambiguity fixing possible (Teunissen 1997). The implication for PPP is that the elimination of the ionospheric delay on measurements using traditional linear combinations is not adequate to facilitate rapid AR. In fact, the convergence period for PPP will not be changed significantly by simply because the ambiguities are integer-valued as seen in previous section. It has been shown that explicitly estimating and constraining the ionosphere within the PPP-AR model can permit instantaneous “re-convergence” of PPP solutions after cycle slips have occurred (Banville and Langley 2009; Collins and Bisnath 2011; Geng et al. 2010; Zhang and Li 2012). When signal lock to a satellite is lost, the ionospheric delay estimates are extrapolated from previous epochs in order to “constrain” the ionosphere until the GNSS signal is re-acquired. This method can be used globally and is effectively independent of any local or regional network. However, the efficiency of this method is somewhat limited and is not suitable, for example, when cycle slips occur during large ionospheric fluctuations or the observation dataset has long data gaps. The second approach, which specifically deals with instantaneous ambiguity fixing after a receiver cold start, is to incorporate externally-derived ionospheric information (Juan et al. 2012). In principle this information can be obtained from ionospheric models such as the Klobuchar model or the Global Ionospheric Maps (GIMs), which may result in some improvement in ambiguity fixing. However, it still requires a considerable time (more than 10 minutes) to fix the initial phase ambiguities to integer values. This is because GIMs with a nominal accuracy of 2-8 TECU in the vertical (not slant) direction are not sufficiently accurate to serve as a robust constraint for rapid ambiguity fixing (1 TECU corresponds to 16.3 cm range error). 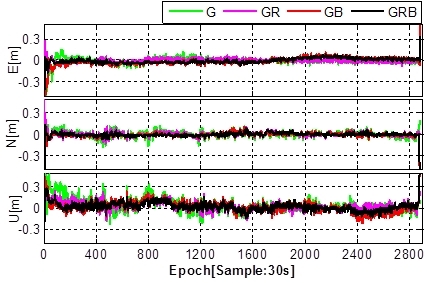 Figure 2 shows the errors of single-differenced ionospheric delays on GPS L1 at MOBS IGS station calculated using post-processed GIMs provided by the IGS on 13 August 2014. The L1 ionospheric delay errors varied between 47 cm and 69 cm RMS, which corresponds to 2-3 TECU of slant TEC (Total Electron Content) errors. The accuracy with which the ionospheric corrections need to be provided depends on the wavelength of the GNSS signals used. Therefore the required accuracy of the ionospheric corrections must be better than a few centimetres to allow rapid-to-instantaneous ambiguity resolution in PPP. Another possible solution is to use externally-derived ionospheric delay estimates from a dense regional GNSS reference network (Li et al. 2010). This approach makes possible instantaneous ambiguity fixing within seconds, which is equivalent to RTK performance. However, this approach is only applicable on a local or regional scale where there is a dense Continuously Operating Reference Station (CORS) network. Fig. 2 Single-differenced ionospheric delay errors on GPS L1 at MOBS IGS station. The errors were calculated from using the vertical TEC values from the post-processed GIMs on 13 August 2014. A Hybrid System of PPP and Network-RTK? The notion of PPP-RTK was first described by Wübenna et al. (2005). PPP-RTK is a synthesis of the positive characteristics of PPP and network-RTK (Wübbena et al. 2005). Network-RTK solutions can be generalized in two ways, i.e., the mostly commonly used technique is the use of Observation Space Representation (OSR-RTK) such as the Virtual Reference Station (VRS) and Flächenkorrekturparameter (FKP) techniques; and the other is State Space Representation (SSR-RTK), or loosely termed PPP-RTK (Collins et al. 2012). The original concept of PPP was a precise positioning technique that works solely on SSR corrections determined from a sparse global network of CORS stations. Instead of lumping all error components together as one error (i.e. correction), as is the case of OSR-RTK, SSR errors are bettered modelled and transmitted individually. This leads to improved performance as bandwidth can be optimized based on the spatial and temporal characteristics of the errors. However, as it has been already mentioned, PPP engineered in the traditional sense may never reach the level of performance of RTK, with its possibility of instantaneous ambiguity fixing. So, if PPP is scaled down requiring local/regional atmospheric corrections to be provided, then the unique characteristic of PPP as a global wide-area precise positioning technique is compromised. Similarly, if SSR-RTK is expanded to a global scale, it is essentially equivalent to PPP (Collins et al. 2012). Although it may appear that PPP and RTK are not mutually exclusive, the utility of these two techniques could be merged. This is the irony of PPP-RTK technique. PPP is a unique positioning technique that can truly offer global solutions without the requirements of local/regional reference networks; whereas RTK/network-RTK will continue to dominate regional positioning especially when a dense local/regional GNSS infrastructure has already been established. Integration of these two techniques would lead to improved position accuracy and convergence time but the performance is now dependent on the extent and density of the reference networks, which is critical for the provision of accurate atmospheric information to aid rapid ambiguity fixing. Hence SSR-RTK is a preferred expression as it makes a clearer distinction between the standard PPP and RTK techniques. With the advent of modernized and other upcoming GNSS and RNSS systems, it would be remiss of the authors not to discuss the potential benefits of these additional constellations on the accuracy and convergence time for PPP. Figure 3 shows results of multi-GNSS float-PPP solutions at two GNSS reference stations located in Melbourne, Australia on 11 January 2015. GPS, GLONASS and BeiDou measurements were post-processed in kinematic PPP mode. Table 2 shows the RMS errors (one-sigma) for the East, North and Up components computed from seven days of GNSS data, 9-15 January 2015. The convergence criterion for the kinematic PPP is that the positioning errors reach, and remain within ±20 cm. It can be seen that the GPS+GLONASS+BeiDou PPP significantly improves the PPP performance compared to the GPS-only solution with an average accuracy improvements of 20% and 30% in the horizontal and vertical components, respectively. The convergence time is shortened by about 20% when compared to a single-constellation PPP solution (Ren et al. 2015). 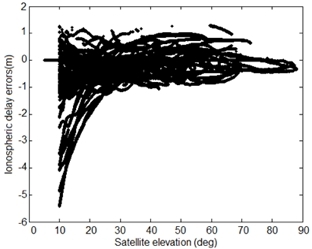 It is also important to note that the time series of the multi-GNSS PPP solutions are much more stable than the GPS-only solutions, with much smaller and fewer fluctuations. Li et al. (2015), Chen et al. (2015) and Tegedor et al. (2014) reported similar findings. That is, that the addition of BeiDou, Galileo and GLONASS systems to the standard GPS-only scenario could significantly shorten the convergence time for PPP and improve the positioning accuracy, especially in GNSS-challenged environments (Chen et al. 2015; Li et al. 2015; Tegedor et al. 2014). Fig. 3 Kinematic PPP processing using multi-GNSS data, i.e., GPS-only (G), GPS+GLONASS (GR), GPS+BeiDou (GB), GPS+GLONASS+BeiDou (GRB), for GNSS station BNLA (top) and WORI (bottom) in Melbourne, Australia on 11 January 2015 (Ren et al. 2015). These results are float-PPP solutions. Table 2 RMS errors and convergence time of the multi-GNSS PPP kinematic solutions based. The RMS values were computed at one-sigma using seven days of GNSS data from 9-15 January 2015. Furthermore, performing PPP with triple-frequency observations is now possible with the availability of the L5 signal being transmitted by the modernized GPS Block IIF satellites along with new satellite constellations such as Galileo, BeiDou and QZSS (Geng and Bock 2013; Lauricheese 2015; Tegedor and Ovstedal 2013). 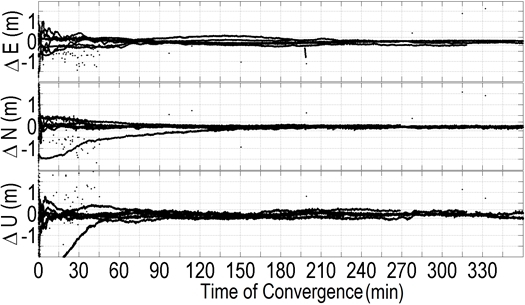 Triple-frequency processing has a significant impact on ambiguity convergence time, achieving ambiguity-fixed solutions within a few minutes or even shorter. The accuracy of triple-frequency PPP is also subsequently improved to about the 10 cm level within a very short period of time due to extra-widelane ambiguity resolution, which can be completed almost instantaneously (Lauricheese 2015). Nevertheless, issues such as interoperability and compatibility need to be addressed to allow for successful integration of observations from multiple constellation GNSS systems and signals. In this section, we will look at the two types of critical infrastructure that are necessary for implementing real-time PPP: (a) availability of precise satellite orbit and clock correction products in real-time; and (b) dissemination of corrections allowing users to operate with comparative ease. The IGS has been providing precise satellite orbit and clock corrections for more than a decade and these products are freely available over the Internet. The IGS orbits and clocks come in various forms and are delivered with some delay, to support post-processed applications. For example, the IGS Final satellite orbit and clock products are of the highest accuracy but are delivered with a latency of 12–18 days. Through its Real-Time Service (RTS), the IGS extends its capability to support PNT applications requiring real-time access to the IGS products and GNSS data streams. At present, the IGS-RTS provides GPS corrections as official products. The GLONASS products are currently provided as experimental products and will soon be included within the service when the RTS reaches its full operating capability. Other constellations will be added to the portfolio products over time. In addition, the IGS is providing multi-GNSS precise orbit and clock products, through the IGS Multi-GNSS Experiment (MGEX) in order to gain experience and insight into multi-GNSS processing, so as to ultimately support multi-GNSS applications. 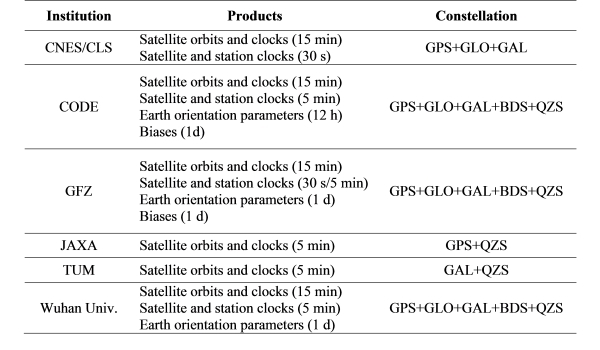 Five MGEX analysis centers are presently contributing multi-GNSS products in various combinations and sampling rates as show in Table 3 (Montenbruck et al. 2014). The MGEX analysis centers are the Centre National d'Etudes Spatiales (CNES), Center for Orbit Determination in Europe (CODE), GeoForschungsZentrum Potsdam (GFZ), Japan Aerospace Exploration Agency (JAXA), Technische Universität München (TUM). Since 2015, CNES and JAXA real-time analysis centres are also generating real-time correction streams enabling multi-GNSS PPP. Table 3: An overview of the available IGS MGEX products as of October 2015. Another requirement for real-time PPP is the communication channel(s) used to disseminate the correction data. These correction data need to be transmitted via a communication link to users in a standard format and protocol, which would allow GNSS receiver manufacturers to implement them in their receivers’ firmware. The correction dissemination methods can be grouped into terrestrial-based using the Internet or cellular delivery method; and space-based transmission using satellites. Currently, the corrections enabling real-time PPP, i.e., the IGS RTS, are freely available via the Internet. These corrections are streamed in the RTCM (Radio Technical Commission for Maritime Services) SSR format. The NTRIP (Networked Transport of RTCM via Internet Protocol) stream transport protocol is used to disseminate the correction data. Some commercial service providers such as Trimble and Fugro are also providing real-time PPP service in propriety formats, via terrestrial communication links and L-band communication satellites. Space-based systems are the ideal communications link for SSR correction data transmission, as it does not suffer from the ground-based telecommunication issues of connectivity, latency, standards and transmission on different radio frequencies. Furthermore, the space-based delivery method is more in line with the view that PPP is a global wide-area positioning technique. Ideally, the dissemination of SSR correction data is preferred with a GNSS-compatible signal, to avoid the need for additional communications hardware at the user end to access the SSR corrections. Galileo and QZSS (Quasi-Zenith Satellite System) have augmentation signals capable of transmitting these corrections. The L6 signal (formerly known as the “LEX signal”) being transmitted by the QZSS is an example of a space-based delivery channel that enables real-time PPP. When fully deployed in 2023, QZSS will consist of four satellites in highly inclined elliptical orbits and three geostationary satellites. The goal of QZSS is to enhance the availability and performance of GNSS over Japan and the region centered on the 135°E meridian. In addition to the navigation signals that are interoperable with GPS, QZSS also transmits two augmentation signals, i.e. L1S (formerly known as “L1-SAIF”) and L6. The L1S is compatible with the aviation-style SBAS (Satellite-Based Augmentation System), which provides submeter-level accuracy wide-area differential corrections, as well as integrity for safety-of-life services. The L6 signal, on the other hand, is designed to enable high accuracy real-time positioning. A joint research project between the Australian Cooperative Research Centre for Spatial Information (CRCSI) and JAXA established between 2013-2015 aimed at evaluating the feasibility of utilizing the QZSS L6 signal to deliver high accuracy real-time precise positioning for Australian PNT users (Choy et al. 2015). The transmission of regional or national messages for precise positioning is of interest for Australia as its ground telecommunication network required for the implementation of the network-RTK technique is limited and mainly concentrated in urban areas. Transmission of GNSS corrections via a satellite-link allows large areas to be serviced. Figure 4 shows the performance of static GPS PPP solutions for the RMIT GNSS reference station in real-time on 1 August 2013, using the L6 signal with precise GPS satellite orbits and clocks generated by JAXA. Figure 5 shows the accuracy of real-time kinematic GPS PPP using the L6 signal. Additional information on this project can be found in Choy et al. (2015). Table 4 outlines the RMS values of the real-time kinematic PPP solutions, i.e., GPS-only and GPS+GLONASS+QZSS, using the QZSS L6 signal. The results were based on series of real-time GNSS data collected at a GNSS reference station in November 2014 and May 2015 and the data processed in kinematic PPP mode. Note that QZSS began transmission of satellite corrections for GLONASS and QZSS in 2014. From 2018, QZSS will transmit on the L6 signal centimeter-level “augmentation data” generated by Mitsubishi Electric Corporation and GEO++ to support SSR-RTK. This service will enable instantaneous centimeter-level positioning accuracy in real-time for the Japanese coverage area. Fig. 4 Real-time PPP errors in static mode using the QZSS L6 (blue) and the IGS (CLK-11, green) corrections. The data was collected on 1 August 2013 at the RMIT GNSS reference station located in Melbourne, Australia (Choy et al. 2015). Fig. 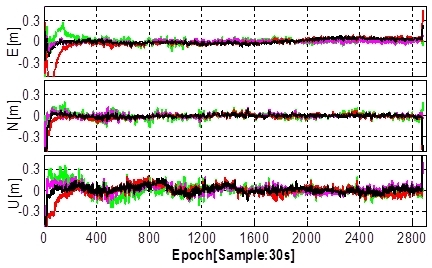 5 Real-time PPP errors in kinematic mode using the QZSS L6 corrections. The results were based on data collected from 17-22 September 2013 at the RMIT GNSS reference station located in Melbourne, Australia (Choy et al. 2015). Table 4 RMS errors of the real-time kinematic PPP solutions using the QZSS L6 signal. Series of static GNSS data were collected at the RMIT GNSS reference station in November 2014 and May 2015 and the data were processed in kinematic PPP mode. PPP is an elegant positioning technique that conforms to the original intention of GPS usage, which is “single receiver positioning”. PPP can in principle provide positioning solutions at centimeter-level accuracy anywhere in the world, without the need of having one or more nearby reference stations. PPP only requires a small number of reference stations distributed globally, which makes this mode of positioning highly attractive from the point of view of costs and operationally complexity. The PPP technique is especially useful for positioning and navigation in remote regions where ground-based CORS infrastructure is sparse or unavailable; as well as to cover a wide-area where investment in the establishment and operation of a dense CORS infrastructure cannot be justified. Although PPP presents definite advantages, its applicability is currently limited by the long convergence time, of the order of tens of minutes, even with implementation of ambiguity resolution procedures and multi-GNSS observation processing. The key to instantaneous convergence for PPP is the availability of accurate ionospheric delay corrections. The requirements on accuracy for these corrections are very challenging, which currently mandates a dense well-distributed CORS infrastructure similar to that of network-RTK. The attractiveness of PPP lies in the state-space representation of errors, which provides a high level of flexibility and scalability. Fundamentally in regions where CORS infrastructure exists, RTK-like performance could be expected. With improved modeling of ionospheric delay error, the separation of CORS can be extended, from tens to hundreds of kilometers. Fixed-PPP solutions would then be possible at all times and all locations. However, if this system is expanded to a global scale without a dense CORS network, then the performance would fundamentally be equivalent to that of PPP. PPP has come a long way, and is capable of delivering high accuracy point positioning solutions in post-processing mode, and more recently in real-time, as demonstrated both in commercial services and by academic researchers. Nonetheless PPP still requires further algorithm development to reduce the convergence time, e.g., triple-frequency PPP; as well as to provide quality indicators, along with accurate PPP solutions to gain industry acceptance for real-time use, especially for safety- and liability-critical applications. What is also interesting now is we are seeing a shift in technological and infrastructure design so as to broadcast PPP corrections as an inherent value-added service by GNSS satellites, e.g. in the case of QZSS and Galileo, and perhaps also for BeiDou. This evolution would be significant as it would enhance the performance of traditional single receiver GNSS positioning, and would bring immense benefits to our society. To conclude, PPP and RTK were originally developed independently of each other in order to support different purposes. It is expected that these two modes of positioning will likely co-exist for many years to come. RTK will continue to deliver GNSS users with high accuracy instantaneous positioning, while PPP will complement RTK by providing the flexibility, scalability and efficiency to meet the demand of future PNT applications. The authors wish to acknowledge the efforts of all the entities contributing to the IGS for providing products for PPP; Ken Harima from RMIT University and Paul Collins from Natural Resources Canada (NRCan) who provided some of the figures and results presented herein; colleagues who provided insight, data and stimulating discussions that greatly assisted in the preparation of this paper. The authors gratefully acknowledge the anonymous reviewers for carefully reading the paper and providing constructive comments. This paper was produced as part of the work of the International Association of Geodesy (IAG) Working Group 4.5.2: Precise Point Positioning and Network RTK and the International Federation of Surveyors (FIG) Working Group 5.4: GNSS. Kouba J (2009) A Guide to using International GNSS Service (IGS) Products. http://igscb.jpl.nasa.gov/components/usage.html. Lauricheese D (2015) Handling the Biases for Improved Triple-Frequency PPP Convergence. GPS World. April 2015. Laurichesse D, Mercier F, Bertias J, Broca P, Cerri L (2009) Integer Ambiguity Resolution on Undifferenced GPS Phase Measurements and its Applications to PPP and Satellite Precise Orbit Determination Navigation. Navigation 56(2):135-149. Montenbruck O, Steigenberger P, Khachikyan R, Weber G, Langley R, Mervart L, Hugentobler U (2014) IGS-MGEX: Preparing the Ground for Multi-Constellation GNSS Science. Inside GNSS, January/February 2014. Suelynn Choy is senior lecturer of Surveying and Geodesy at RMIT University, Melbourne Australia. Her research interests are in the areas of GNSS precise positioning and atmospheric remote sensing. Suelynn is currently the co-chair of the IAG Working Group 4.4.2 on Integer Ambiguity Resolution for Multi-GNSS PPP and PPP-RTK" and FIG Working Group 5.4 on GNSS. Sunil Bisnath is an Associate Professor of Geomatics Engineering in the Department of Earth and Space Science and Engineering at the Lassonde School of Engineering at York University in Toronto, Canada. His research interests over the past two decades focus on precise GNSS positioning and navigation for a multitude of applications. He holds an Honours B.Sc. and M.Sc. in Surveying Science from the University of Toronto and a Ph.D. in Geodesy and Geomatics Engineering from the University of New Brunswick. Chris Rizos is Professor of Geodesy and Navigation at the University of New South Wales, Sydney, Australia. Chris is the immediate past president of the International Association of Geodesy (IAG) and co-chair of the Multi-GNSS Asia Steering Committee. Chris is a Fellow of the IAG, a Fellow and current president of the Australian Institute of Navigation, and a Fellow of the U.S. Institute of Navigation.